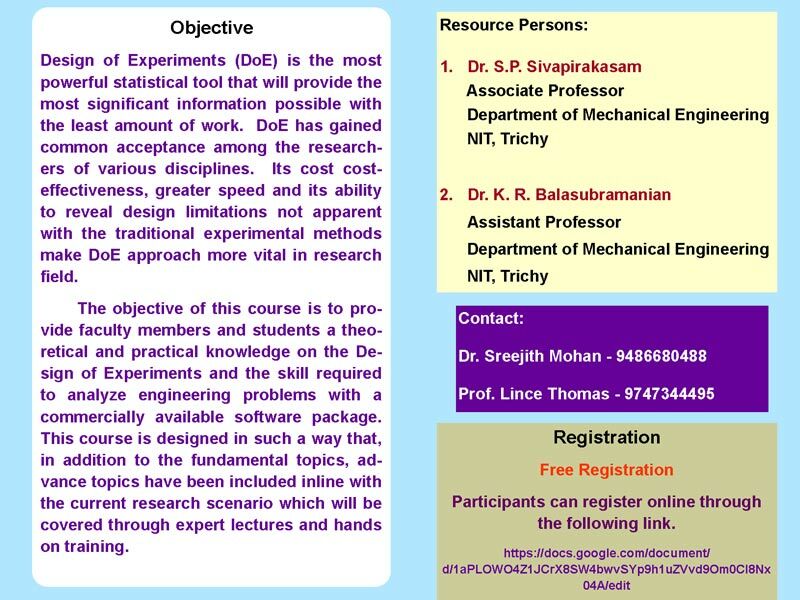 11-Dec-2018|6 Days Workshop On MSP & Primavera P6. 6 Days Workshop on MSP & Primavera P6. 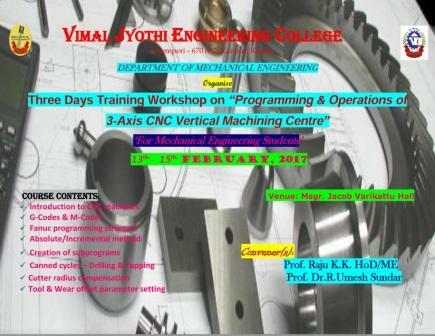 The Department of Mechanical Engineering is planning to organize a Three days workshop on “Programming and Operations of 3-Axis CNC Vertical Machining Centre” during 13th - 15th February 2017. This training workshop builds on the knowledge gained in the CNC milling programming workshop. Students design CNC programs for a three-axis CNC machine. Topics in the training workshop include machine axis, co-ordinate systems, program structures, program formats, preparatory commands, calculating RPM, and surface speed for tools and various drilling canned cycles. At the end of this three days training workshop, students should be able to interpret and convert basic blueprints to a manufacturing operation specific with tooling documentation and plan sheet for the CNC mill. 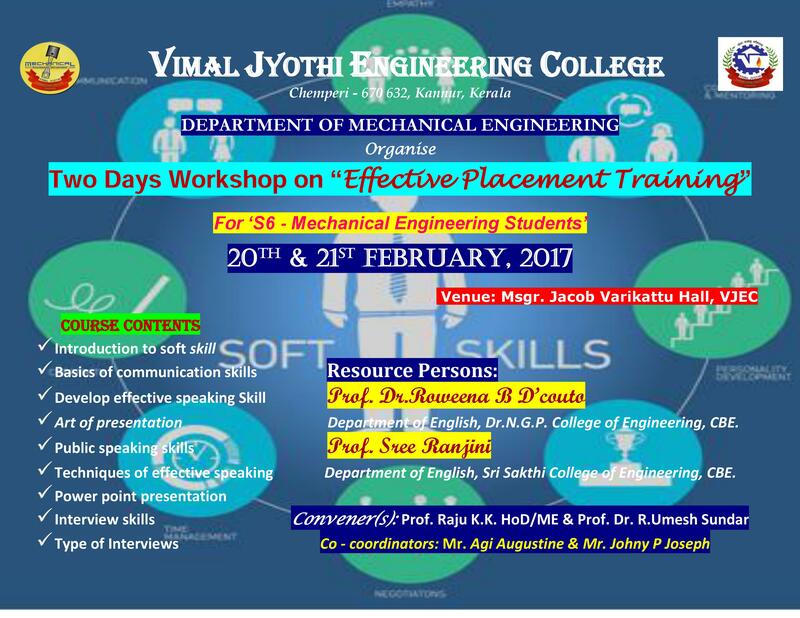 he Department of Mechanical Engineering, Vimal Jyothi Engineering College is planning to organize a Three days training workshop on “Programming and Operations of 3-Axis CNC Vertical Machining Centre” during 13th - 15th February 2017. This training workshop builds on the knowledge gained in the CNC milling programming workshop. Students design CNC programs for a three-axis CNC machine. Topics in the training workshop include machine axis, co-ordinate systems, program structures, program formats, preparatory commands, calculating RPM, and surface speed for tools and various drilling & tapping canned cycles. At the end of this three days training workshop, students should be able to interpret and convert basic blueprints to a manufacturing operation specific with tooling documentation and plan route sheet for the CNC mill. 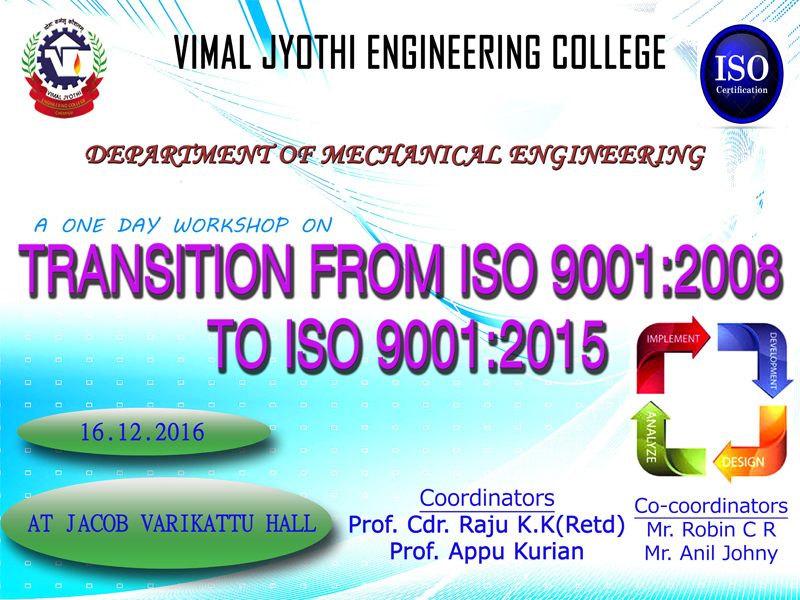 The department of Mechanical Engineering proudly announces a one day training workshop on “Transition from ISO 9001:2008 to ISO 9001:2015”. ISO 9001 is a standard that sets out the requirement for a quality management system. It helps organizations to be more efficient and improves client satisfaction. The aim of this workshop is to enhance the knowledge of internal auditors for conducting the internal auditing as per the pristine-updated version of ISO 9001:2015. The course is designed in such a way that, in addition to the fundamental knowledge, the auditors or authorized personals will be an expert in documentation procedure of the relevant records.- especially the changes that has to be done with the former version , for refurbishing to the newer one. 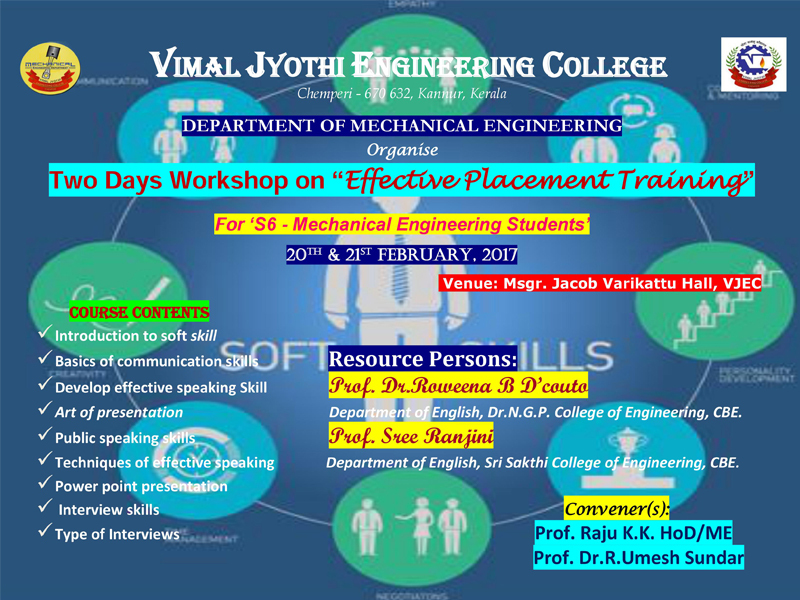 Two Days Workshop on “EFFECTIVE PLACEMENT TRAINING” - 20th & 21st February 2017. 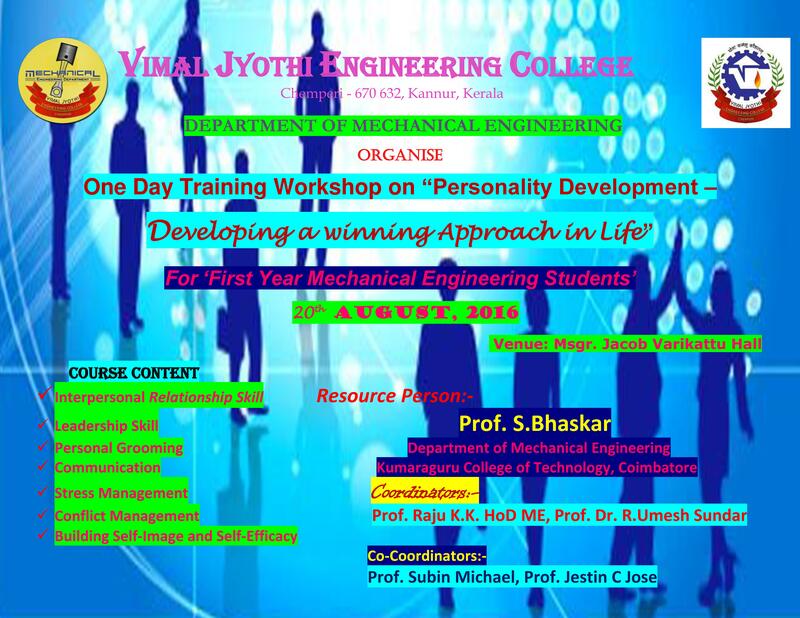 ONE DAY WORK SHOP ON PERSONALITY DEVELOPMENT FOR S1 STUDENTS. TOPIC INCLUDE LEADERSHIP SKILL, PERSONAL GROOMING, COMMUNICATION, STRESS MANAGEMENT ETC. 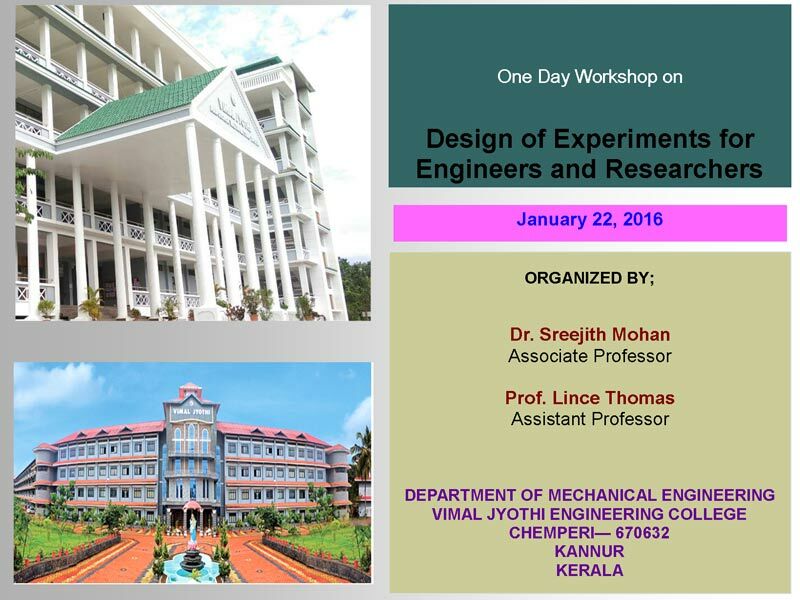 07-Feb-2015|Sponsored National Seminar On "Advances In Manufacturing Technologies"
Sponsored National Seminar on "Advances in Manufacturing Technologies"